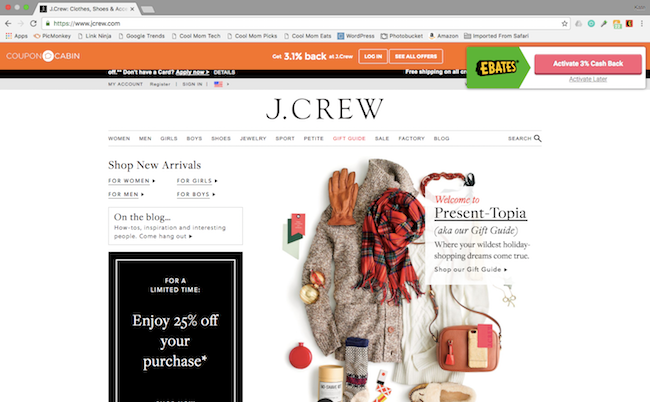 4 Google Chrome extensions that help you save money on your holiday shopping. 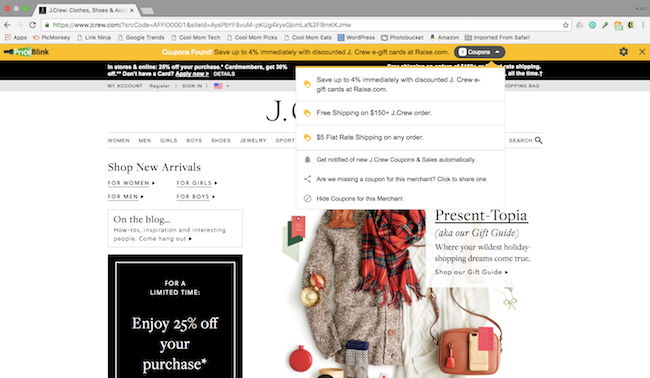 4 Google Chrome extensions that help you save money on your holiday shopping. So, sure, go ahead and get the new boots too. If you’re trying to save some money this holiday season, you don’t necessarily have to nix your coffee spending or skip that new pair of shoes. Here are 4 great Google Chrome extensions that help you save money while you’re shopping online. And the best part: you don’t really need to do anything extra. Related: 10 of the very best shopping apps to help save you money. And time. 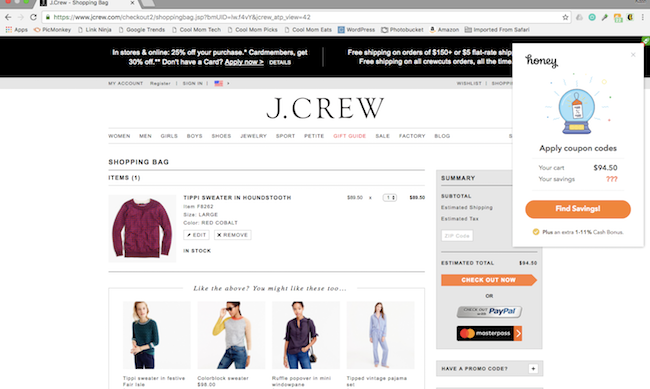 Coupon Cabin notifies you of sales at the sites you’re already browsing in a alert bar at the top of the screen. Their promo codes and coupons are guaranteed to work, which means you don’t end up trying 15 different codes before finally giving up. Many sites they link to also have an opportunity for you to earn cash back on your purchase. You can chose for them to send it to you in the form of a check, PayPal transfer or via Chase QuickPay. When you’re shopping with the PriceBlink extension added, it will automatically scan other online stores to look for a better price. If — and only if — a better price is available, the banner will pop up showing you that price (or the coupon that will get you that price) somewhere else. And a nice feature: it also displays the shipping costs, so you know the full amount you’ll be paying at another site. If you get annoyed at extensions that tell you about better deals before you’re even ready you want to buy, get the Honey extension added to Chrome. It waits and applies coupons for you once you’re at checkout. 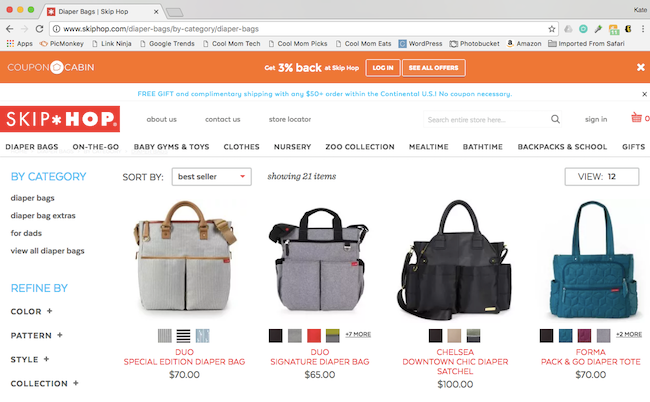 All you have to do is click the Honey button when you’re shopping at a supported online store, and it will automatically test codes at checkout and find the one that will save you the most money. Or, if you’re at a site and just wondering where to start shopping, you can click the Honey button to see the coupons and sales available there so you know what to put in your cart in the first place. So helpful! eBates is one of the most popular cash-back shopping extensions out there, in fact, they even have an eBates credit card you can use to save money on all your shopping, in-stores or online. The focus is definitely more on the cash back aspect — where you earn a percentage back on all purchases you make, up to 40%. This money is sent to you via PayPal or check, and you can even get bonuses for referring friends to your site. It’s important to note that most of these sites also track your online activity through cookies, so if privacy is a concern for you, definitely check their privacy policies. You can also turn off your cookies, but this may impact how much of these services you have access to while you’re shopping. Really great suggestions and video! Thank you. Is there an extension while you are viewing youtube comments from the comments section area, the youtube post is still playing by the side of Chrome browser instead of the very top?